Are You 50 or Better? Please join us for the next Lunch N’ Life sponsored by the Shepherd’s Center of Fairfax-Burke on Thursday, July 19th, (12:00-2:00 p.m.) at Burke Presbyterian Church 5690 Oak Leather Drive, Burke. The guest presenters are Dr. Donald Trump and Dr. Sage Bolt with INOVA speaking on Life with Cancer. For reservations, call Bea Stephenson at 703-273-5730 by July 13th. The cost is $10.00; checks payable to SCFB. If transportation is needed, call the SCFB office (703) 323-4788. See www.scfbva.org for more information. It’s impossible to imagine the positive impacts this year’s donations of clothing may have on the lives of needy people, both locally and abroad. Individuals from twelve organizations came to the parish and selected clothing for their clients. Our volunteers delivered dozens of men’s and women’s suits to ECHO in Springfield. Evening dresses and accessories were sent to Quantico for use by military wives and many boxes were also carefully packed for shipment to Honduras, The Philippines, Puerto Rico, Guatemala and Mexico. St. Mary’s clothing drive has adapted its scope through the years but the mission of caring for the needy and the generous hearts of those who take part are as strong as ever. We extend a huge thank you to all who helped make this year’s effort so successful. 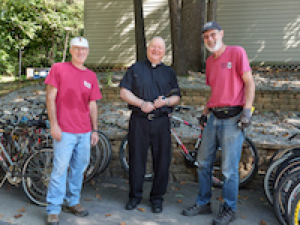 Donations of 77 bikes and $430 made the recent Bikes for the World collection at St. Mary’s a successful day. Shown here are two volunteers and our pastor, all supporters of the organization that repairs and recycles bikes to needy people in developing countries to enhance lives through a means of transportation, To learn more or to donate a bike, visit www.bikesfortheworld.org. Reece’s Rainbow Ministry is excited to announce its second Walk for The Rainbow on October 28th! All funds will benefit the organization which advocates and raises funds for the international adoption of orphans with Down syndrome and other special needs. We will begin with Mass at 9:15 AM then meet at the Parish Center at 10:15 AM to begin the approximately 2 K walk around the neighborhood of Saint Mary’s. Ministry Committee members will be available for registration and to provide additional information after Masses on October 14th, 15th, 21st, and 22nd. The Cost is $10.00 per participant. Registration and/or donations can also be given to committee members. Checks should be made payable to Reece’s Rainbow. Walk-ins are welcome on the day of the event. For additional information contact Karen Abraham on 703-978-1147 or Karen.abraham56@gmail.com. Come Walk with Us!